ou don’t have to have been born in New Jersey to quickly feel at home. My 18-year career at Bristol-Myers Squibb led me and my family to the Garden State from Italy more than a decade ago and it didn’t take long for us to appreciate how much the state has to offer -- from its great schools and diverse people to incredible beaches and a range of industries. 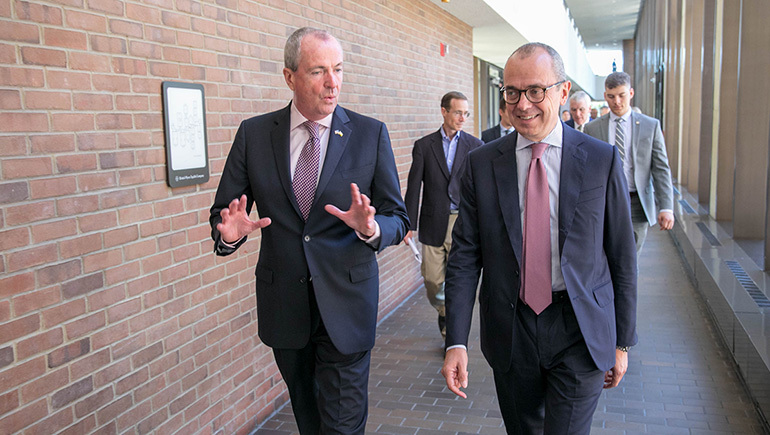 Governor Phil Murphy (left) with CEO, Giovanni Caforio, touring Bristol-Myers Squibb’s Lawrenceville, N.J., R&D labs and learning more about how we are innovating for patients. Our company has had a long-standing presence in New Jersey. Over a century ago, E.R. Squibb & Sons relocated from Brooklyn to New Brunswick and became one of the first life sciences companies established in New Jersey. The move helped solidify the state’s reputation as a great place to do business and a rich source for scientific innovation. As both a business leader and a resident, it was a pleasure to meet with New Jersey Governor Phil Murphy this week at our Lawrenceville campus. I was proud to share with him the work our talented team of scientists is doing to help develop and deliver transformational medicines for patients. I also had the opportunity to learn more about his road map to drive economic development throughout the state. The governor shared his new economic blueprint, which includes a strong commitment to fostering diversity throughout the state; investing in STEM education in underserved communities; and continuing to drive innovation, including plans to build an Innovation hub in New Brunswick. These priorities are very much aligned with the focus of our company in New Jersey and around the world. I was very proud to share the significant achievements of our Global Procurement organization in developing a robust slate of diverse suppliers that help our company achieve our important mission. Governor Murphy was so impressed with how we have cultivated partnerships with small businesses owned by women, veterans, people of color and those with disabilities, that he requested we meet with his administration to share best practices in building and maintaining such relationships to support these companies. I’m extremely proud that we are among the top-tier companies continuing to drive innovation and invest in New Jersey’s future. With more than 6,000 employees across seven campuses throughout central New Jersey, I’m extremely proud that we are among the top-tier companies continuing to drive innovation and invest in the state’s future. Two years ago we expanded our presence in New Jersey when we opened our state-of-art campus in Princeton Pike, home to our U.S. Commercial organization. In 2020, we will open two new R&D buildings at our Lawrenceville campus. In addition to our business investments in our New Jersey communities, our employees are incredibly active driving change in local schools and with non-profits. To help build a bright future for diverse students, we are investing in programs to improve STEM education in underserved school districts and helping to build the state’s workforce of the future. As a bio-pharma company committed to contributing to the health and well-being of the patients we serve globally, it is great to know that our work also has a positive impact on the well-being of the communities where we live and work, including New Jersey. Thank you, Governor Murphy and team, for taking time this week to see up close how we are driving innovation. Nearly a year after it opened its doors, our Princeton Pike campus is driving collaboration and innovation among Bristol-Myers Squibb teams thanks to its open floorplan. Here are five ways open workspace has made a difference according to Chris Boerner, Head of International Markets. Our company’s legacy of innovation began in 1858, when our founders made it their mission to bring better health solutions to patients who needed them most. Today, we are continuing that tradition by using the latest science and technology to help improve lives through the research and development of new medicines for serious diseases.